Will Tebow Time Happen In Pittsburgh? Tebow time, will it happen? 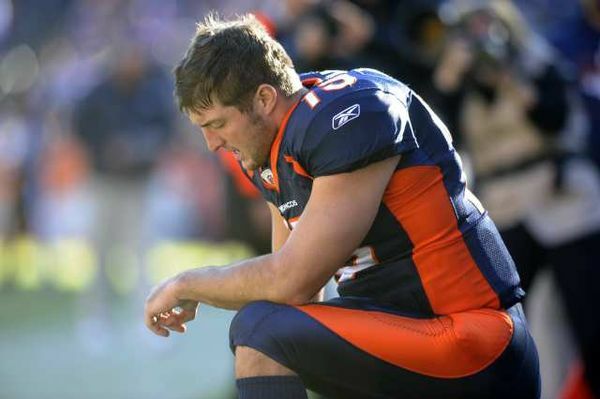 Today at 4:30 Eastern Time the Denver Broncos will play in the first playoff game under quarterback Tim Tebow. Since the Broncos made the switch from quarterback Kyle Orton to Tebow the Broncos have been pretty good as they have won seven games and lost four under Tebow this season. Now despite losing to the Kansas City Chiefs and former quarterback Kyle Orton who was claimed off of waivers 7-3 last week, the Broncos due to an Oakland Raiders loss clinched the AFC West and would go onto the playoffs. As for who they would face, the Pittsburgh Steelers. Now everyone would most likely think that “Tebow Time” will come to an end today as the Steelers, ranked first in yards allowed in the NFL with 4,348 yards against opposing offenses would really shake Tebow. Then you calculate that in Tebow’s last three games he has been completely awful, turning the ball over seven times, three of those turnovers coming from fumbles. However, if you look, the Pittsburgh Steelers have the least most takeaways in the NFL with 15 and they have given the ball away 28 times. As for the Broncos they have been on fire as in their last three games they have forced opposing offenses to turn the ball over nine times. Taking that in, you then add in the factor that Steelers leading rusher, Rashard Mendenhall will be out of this game due to a torn ACL. Then, Ben Roethlisberger is still nursing an ankle injury. So adding those two factors in and then looking at a Broncos defense who has came up clutch before by forcing a turnover or two to help out Tebow and the offense may do it again. Now you can call me crazy, but Tim Tebow out of Florida University will beat the Pittsburgh Steelers today on January 8th, 2012 and here’s why. Week 15, he played the New England Patriots, one of the best if not the best team in the AFC so we don’t count that in. Week 16, the Buffalo Bills it was a cold game that Tebow wasn’t always used too as playing in Florida the weather was much different. However Tebow didn’t do that bad until the end when he was faced at such a deficit that he was put in by his defense, which resulted in multiple interceptions. All it was was that he panicked. Week 17, they just looked out of sync on offense. As for the defense they looked great allowing only one touchdown and despite the 7-3 loss to the Chiefs, I think that it was good that it happened. It was good because it put the Broncos backs against the wall and as the underdogs again, a place that they have seemed to strive at as last time they were in that similar position they won seven straight. So now the Broncos will host a team that has sometimes struggled to put a team away as 7 of their 12 wins have been very close as have two of their losses. For any other team this may not be a problem for the Steelers, but facing the Broncos it should be as this season they have had six fourth quarter comebacks all lead by Tim Tebow. Another factor that will be added in is there won’t be as many Steelers fans as not only is it a home game for the Broncos, but because Broncos fans were blocking Steelers fans from purchasing tickets at the stadium by forming human walls, blocking fans from purchasing online or through the phone by looking at area codes and zip codes, and any other way to prevent Steelers fans from coming. So get on your knee and bow your head boys and girls, because it’s Tebow Time and it’s about to take place yet again in Denver.